The bleaching milestone is about to disappear into our wake! The key is keeping the wood wet for an extended period of time, and not applying one coat and calling it good. The wood must be kept wet, at least 8-12 hours in our experience, and this boat feels like it doubled in size as we raced around with our pails of bleach and 3-inch foam brushes. (We use foamies rather than chip brushes. Doing so helps guard against applying excessive liquid, especially to vertical surfaces, and thereby allowing rivulets of bleach run down and leave blonde streaks behind. For the same reason, after applying a first coat to the decks, covering boards and cockpit components, we attach the topsides and transom from the waterline up. That way there is no chance that rivulets of bleach runs down and onto dry wood, which almost certainly will leave a blonde streak behind. 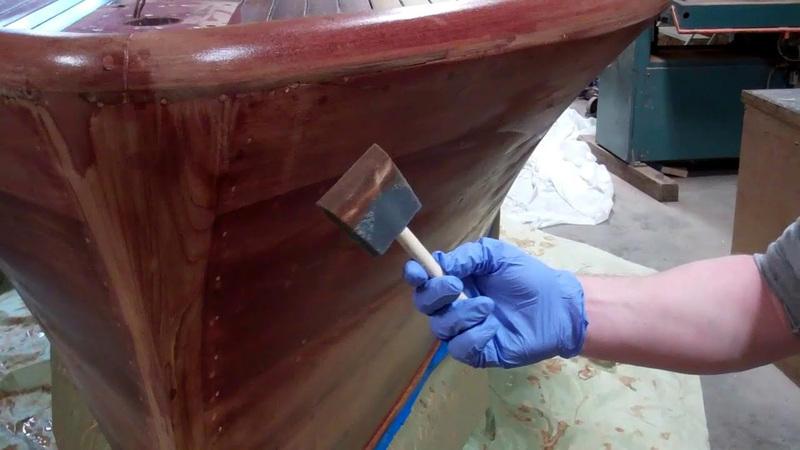 Because the first coat absorbs very quickly, we also apply bleach in tandem, working around the hull until all surfaces have been thoroughly wetted. Then the three of us work different areas, applying bleach until the surface glistens and stays that way. That the U22 offers seemingly endless surface is evidenced by the fact that, as this clip closes we have applied 1.5 two-gallon kits. We now leave her alone for several hours, before we will apply more bleach if the process seems to be losing momentum. She will be a super rare albino U22 by morning!